A 4 level house consuming the total site and designed to pay attention to a corner block and views to Port Phillip Bay. The living spaces are located on the top level with a basement for cars and wine cellar. A small swimming pool is located at the front of the house. The façade was designed to break up the solidity of the house dictated by the programme whilst maintaining views. A 3 level house with basement, home theatre and an indoor swimming pool overlooking Port Phillip Bay. Designed from reinforced concrete with steel and copper cladding to achieve a weathered look to the façade. A holiday house designed around a swimming pool and tennis court, providing open plan and capturing the views of lash cypresses in the sea side setting of Portsea. The façade treatment incorporate ship lapped timber, painted white and a local stone wall which acts as a support to the cantilevered volume signalling the entry to the house in a formal manner. A holiday house designed around existing tea tree. A linear ramp dictates the entry point to an open living space framed by a landscaped courtyard. In a suburban/rural setting, this house was designed around a central axis creating a plan that signalled a strong entry point and an open plan living space to capture the sounds and views of the Yarra river. The river stone wall further emphasises and directs the new comer to the entry point of the house. Extensions and renovations to an existing Victorian cottage. The plan is organised around an internalised courtyard with north facing aspects. A second storey addition sits neatly within this courtyard adding to the boxed façade composition. A 2 storey house designed with all living spaces on the first floor to capture the majestic views of Port Phillip Bay. This holiday house for an extended family was designed to incorporate the views and connection to lake Eildon. A steep site was excavated and levelled to create a platform for the 2 storey house with the balance of the hill as a back drop. 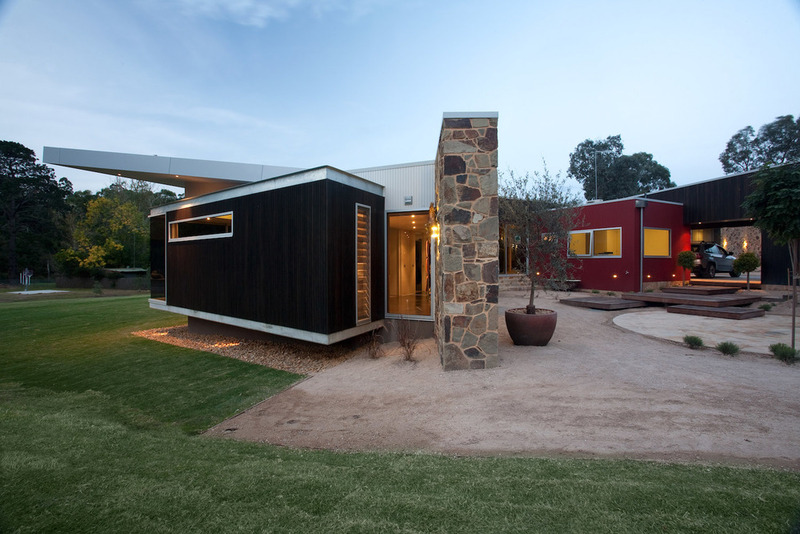 Designed in concrete and steel and cladded in corrugated iron to give this house a level of low maintenance. A swimming pool with a rendered wall further frames the pine and eucalyptus trees. After the 2011 bush fires, this house was designed around the views to the valley and incorporated the latest materials to comply with the new fire codes. A large house in a large suburban block. The house was designed as a 2 storey with living spaces on the ground floor within an internal courtyard facing a large swimming pool and tennis court. A refurbishment of a large house on the coast with a private beach. The existing plan was modified so that all living, kitchen and dining areas open up to a sheltered area with views to the pool and the private beach beyond.